After my horrendous 3 midterm day, Vince took me out for dinner to check out the Indian restaurant Guru on the west end of the city. 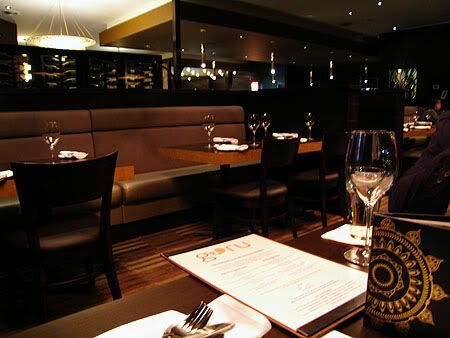 They are regarded as a more expensive fine dining cuisine, and I couldn't wait to see what the interior looked like! 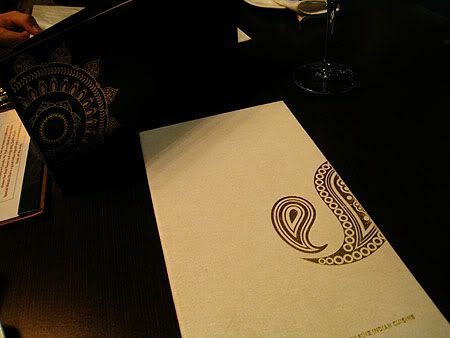 To be honest, the only time I've ever sat down and ordered from a menu at an Indian restaurant was two years ago, at a restaurant in Chunking Mansions Hong Kong. I was terrified of being in that building and didn't pay too much attention to what my friends & I had ordered for dinner. So, on that very Tuesday night, I was facing a dilemma of not knowing what to order. Luckily our waiter was extremely helpful and we ordered two dishes for dinner: butter chicken with garlic naan & lamb biryani with raita. And let me tell you. The food was SOOO good. Unbelievable. 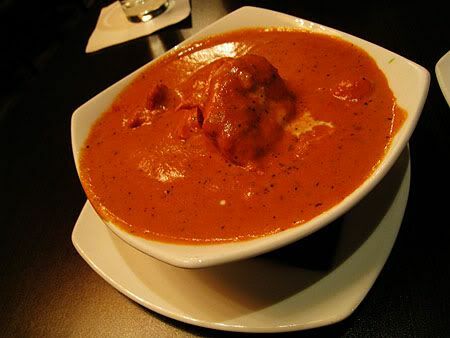 The butter chicken is unlike any that I've had before, and I actually prefer the one here at Guru over any Indian restaurant I have tried in the past. I know that the base of the sauce is supposed to be supported by a rich buttery taste, but this one isn't as strong. The sauce seems to be more tomato based, giving it a tangy personality with kick! We ordered the garlic naan on the side (it isn't included) and the pieces were massive. 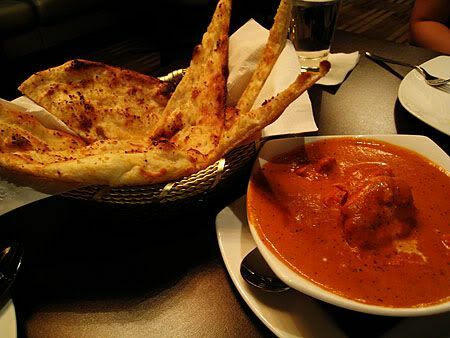 The flavour of garlic was perfect when dipped into the butter chicken sauce. 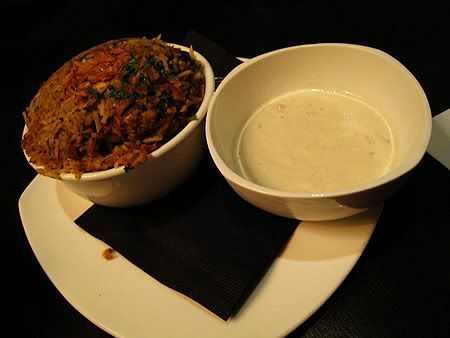 Lamb biryani & raita: Boneless Alberta lamb pieces dum cooked with rose water flavoured rice and spices, served with raita I had no idea what biryani was before ordering it, nor did I have a clue about raita, but I'm glad we ordered it. Biryani is basically a rice based dish infused with herbs and spices, and our order came with lamb. There were crunchy bits of herbs and veggies dashed throughout the fragrant rice, which was slightly spicy, but toned down when eaten with the raita. Raita reminds me of tzatziki, in that it's a yogurt based sauce. The herbs mixed in were not overpowering at all, making it a refreshing sauce to eat with the spicy rice. Even though we had ordered only two dishes amongst ourselves, I was pretty full and we were able to pack a little food home. 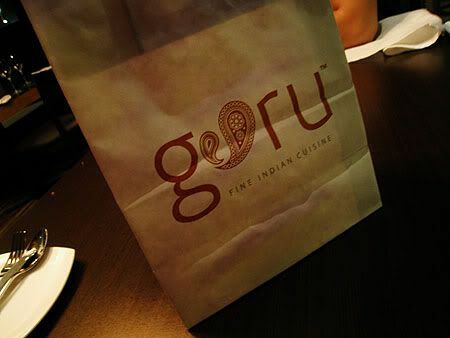 I love when restaurants have their own takeout bags - its so professional & makes me feel like I'm worth a nice bag (HAHA). Seriously.